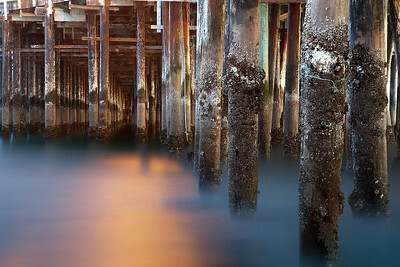 seascape photographs. And the surf can be huge, which also is good for photography and surfing too. 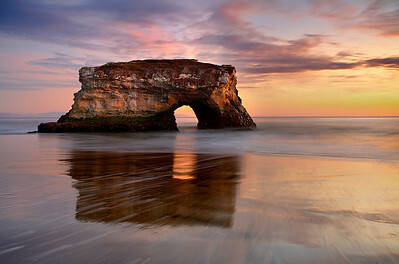 Natural Bridges State Park in Santa Cruz is a great place to watch the sunset. This is one of the few remaining arches, as the other ones have been washed into the sea. New ones will replace them as the years go by. The tip of the Monterey Peninsula and the start of the Big Sur coast 40 miles away are shown in the middle of the arch. In order to show this arch in the best light, I had to wait until November for the setting sun to be at the best angle to show the detail on the arch face. I also wanted some cloud cover, which becomes more common as the 7 month summer dry season comes to a close at this time of year. 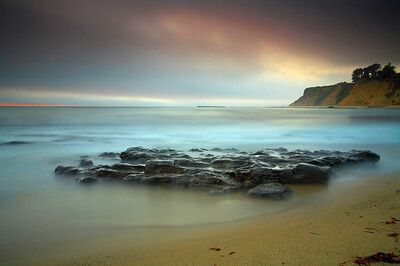 I used a long exposure to smooth the water, highlighting the arch and distant coastline. And I timed it for when the sand was at its most reflective state at low tide. There are many interesting rock and cliff formations at the Hole in the Wall beach in Davenport, 10 miles north of Santa Cruz. Most photography including mine focus on the drama of these formations. 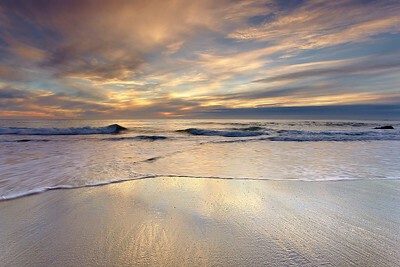 However, the golden sand becomes perfectly glossy in between waves and a dramatic sunset makes it even more glossy and surreal. So I captured it! This is one of many rocky outcrops along this stretch of beach just north of Santa Cruz, California. I often wonder how long this rock has been pounded by long-forgotton storms over the millenia. 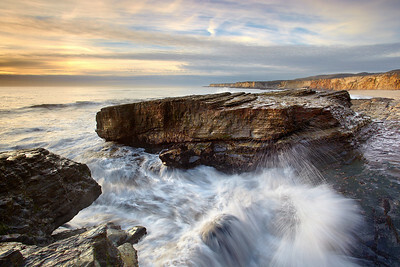 I waited for the light to strike the cliffs and for a nice wave (not too big or small) to strike the rock. 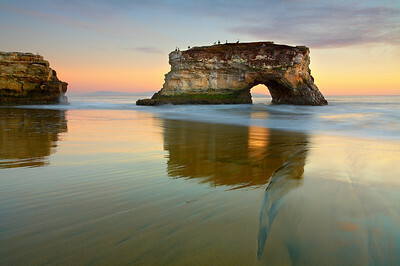 This is another view of Natural Bridges State Park in Santa Cruz, California. I liked the pelicans and the light on the water and rock. Once, these two formations were joined, until a big storm broke them apart back in the 1970's. 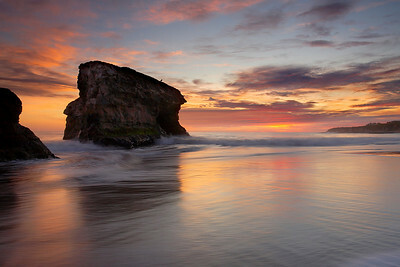 This photo was taken looking north along the beach during sunset at Natural Bridges state park in Santa Cruz. This is a side view of one of the few remaining arches. I chose a medium length exposure in order to show the movement of the water, but not too much. The tripod had to be dug deeply into the sand in order to remain stable as the water rushed by. 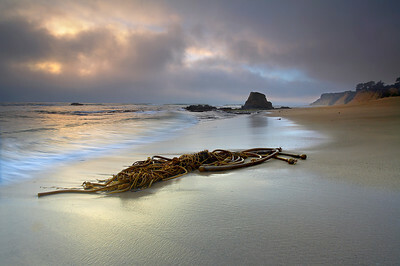 This bunch of sea kelp on this beach just south of Ano Nuevo state park contained all of the warm light from the sky. So I waited for the right combination of wave and cloud to come together. Also, each time a new wave would come in, it rearranged the sea kelp into a new configuration, some of which were much better looking than others. It took a while before a really good arrangement formed in the sea kelp. I watched the surf wrap around this rock with some fine light in the sky. I often like to show the motion of the water, but here I decided to emphasize the beauty of the rock and the serenity of this place. Low tide exposed lots of barnacles and sea anemones on the vertical pilings. At dusk, a light turned on which illuminated the water. It took a while to put order to this rather chaotic scene and wait for the natural evening light to even out with the light from the pier.